One-sentence summary: An American ex-pat shares her experience living in a Parisian suburb in the '90s and the crippling loneliness and depression that dogged her. Do I like the cover? : I do -- I find it very charming and in person, the matte background and the slightly glossy illustrations are catchy. First line: I was always strange. Buy, Borrow, or Avoid? : Borrow or buy if you like found objects, awkward memoirs, and Parisian escapes. Why did I get this book? : Paris. I'm a sucker for all things Parisian. Review: I didn't know what to expect with this book. While the blurb tells me something ('A haunting and moving collection of original narratives that reveals an expatriate’s coming-of-age in Paris and the magic she finds in ordinary objects.') it didn't convey, I think, the real personality LaCava brings to her book. In further crankiness, I thought the subtitle ('A Memoir of an Outsider in Paris') as off-the-mark as the blurb. I found this book to be a memoir of depression, portrayed in a series of playful, odd vignettes, voiced by a lonely American desperate for connection and unable to find the tools to get out of her head and be more present in the world. The book's narrative style is quirky, and I think readers will either love or loathe it. Interspersed in her vignettes, LaCava includes footnotes about an object or person, usually providing some quick trivia or history. The object in question is almost always paired with one of illustrator Matthew Nelson's drawings. For LaCava, these objects are obviously totemic, deeply personal, and emotionally resonant, and the book's physical design -- cloth-bound cover, small size, and deckle-edged pages -- was tactile-ly satisfying, making me read a little more slowly, savor more, as if LaCava and I were in conversation. I found LaCava seemed to need to punish herself for her debilitating depression -- she remarks in a 2009 vignette about how selfish she was, and in a later 2011 vignette, she quotes her mother as saying the same thing. It broke my heart a little, for however 'badly' LaCava might have behaved as a girl-almost-a-teen, she obviously needed help. Moody doesn't equal selfish in my book and I don't know if she felt as if she had to make 'amends' to people in her life for her depression, but it made me angry on her behalf. I wouldn't recommend this exactly as an armchair escape to Paris -- while LaCava shares a passion for certain places, she evokes some strongly while others sort of just float in the background. As a memoir of a time and a place, of one person's pain, this is lovely, sad, moving, and odd. 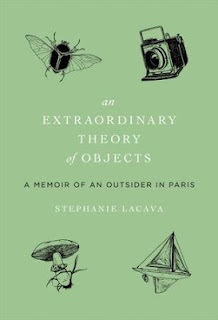 I'm thrilled to offer a copy of An Extraordinary Theory of Objects to one lucky reader! To enter, fill out this brief form. Open to US and Canadian readers, ends 12/20. I can appreciate why you are still grumpy! In this case, I could forgive the distance because LaCava was open about her difficulty in connecting with people and her yearning for that connection. The distance resonated with me in this book. I read another review of this one yesterday, and the blogger who wrote it felt that it was sort of disjointed and whiny. Also, she didn't like the pictures that were included as the found objects. It does seem like a polarizing book, and one that I might not really appreciate to the fullest. I also don't get why she felt she should punish herself for being depressed. It's sad. I could see -- in another mood -- that I might have dismissed this one, but it really just charmed me. Despite the 'distance', I connected with LaCava in a way, and the book felt almost a bit like a conversation with a very shy person -- little tidbits now and then that gave some insight into who she is. This is what has me interested in this memoir: " I found this book to be a memoir of depression, portrayed in a series of playful, odd vignettes, voiced by a lonely American desperate for connection and unable to find the tools to get out of her head and be more present in the world." Considering the real sadness permeating LaCava's story, I didn't want to die after finishing it. It does sound as though LaCava could have done with a lot more help. I wonder if the disconnect kind of shows how LaCava felt alone - with the help issue included. That's my suspicion -- and I'm not sure the genesis of this project, but perhaps she hadn't intended to go so deeply into discussing her depression and that period of her life and so some of that hesitancy comes out in her distance. "a memoir of depression, portrayed in a series of playful, odd vignettes, voiced by a lonely American desperate for connection and unable to find the tools to get out of her head and be more present in the world" - I think your description captures the book exactly.